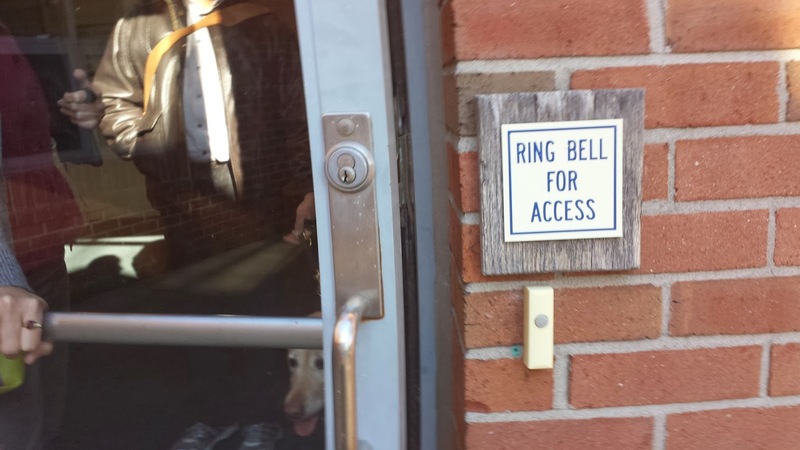 “Ring bell for access”. I have not seen this sort of sign since the ADA was passed into law over two decades ago. When I came across this sign at Hobart William Smith College I knew my presence at a one day conference designed to address disability, bioethics and the humanities was not wanted. Had I entered via this entrance I would have knowingly accepted the fact the organizers violated the ADA. I would be as guilty as they are for violating the letter of the law as well as the spirit of the ADA. “Ring bell for access” is an artifact of the past. This was my reality for many years. Before the ADA was passed into law, I rang many such bells for access to buildings. Half the time no one answered the bell. The other times after an extended wait someone would arrive to open the door. In short, I quickly learned “Ring bell for access” really meant there is no desire or commitment to wheelchair access. The sign might as well read go away. Until today I thought these signs were obsolete—akin to “white only" signs that are a shameful reminder of segregation. My experience yesterday was deeply unsettling. A victory in terms of civil rights was supposedly won 23 years ago with the passage of the ADA. After yesterday, I consider the ADA a hollow victory as decades later I am still constantly put in the position of educating people about disability. I am routinely the only academic with a disability present at conferences. This is tiring and disheartening. Barriers, social and physical, remain commonplace. Two thoughts dominate. First, I was and remain deeply humiliated. Second, how could this happen? The details are as follows: Along with Stephen Kuusisto, I tried to attend the Humanities, Health and Disabilities Study Workshop organized by Sarah Berry and Lester Friedman. 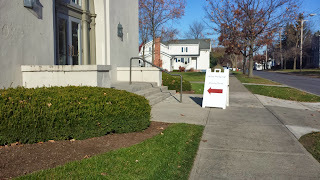 The event was sponsored by Central New York Humanities Corridor, from an award by the Andrew W. Mellon Foundation and held at an elite liberal arts college Hobart William Smith. Dozens of emails were exchanged prior to the event. A website and agenda were established. 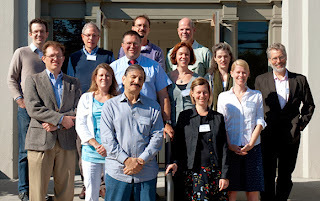 The hard work required to create a vibrant day long discussion was performed. Sadly, absolutely no one bothered to think about wheelchair access. I knew I was in trouble before I got out of my car. I saw the following sign. There was no signage about wheelchair access. Just the above sign pointing one to enter via three steps. The irony to me is that all other participants to my knowledge simply walked up those steps without thought. Not one scholar, people supposedly interested in disability and health care, wondered about the ADA or how a person such as myself who uses a wheelchair could enter. Thankfully Kuusisto is very familiar with the campus. He and his guide dog Nira knew another entrance where I could enter the building. We proceeded to the accessible entrance, went down a hallway to find two steps barring me from the room where the conference was being held. Of course a spectacle ensued. People that know nothing about wheelchair access get involved who desire to help. Ignorance added to the absence of wheelchair access is not helpful. This sort of "help" usually involves powerless people rudely telling me what to do. At this point I am furious as is Kuusisto. I ask Kuusisto to find the organizer Sarah Berry. He sets off and finds her enjoying a cup of coffee. She is blissfully unaware of what is taking place. She is unaware the only entrance to the meeting room is through an emergency exit door. This is a blatant violation of the ADA. I a stunned. Did not a single person do a walk through prior to the meeting? Obviously not. Why should she? I cannot help but conclude she and all others present who were about to spend seven hours discussing disability assumed a scholar with a disability would not be present. This is a fair assumption. Here is a photograph of the group taken after the last time they met. And yes they are standing on the steps I cannot navigate. This is my life. I am routinely the only person present at academic meeting that uses a wheelchair. While I am glad Kuusisto was with me I cannot help but feel completely and utterly alone. In retrospect, I think my presence was considered a problem. Equal access was never thought to be a civil right nor did others involved think that I might have something important to offer. I was a problem. Lip service was paid to wheelchair access. I am sure the organizers were told the event was accessible. This was accepted as gospel truth because either they did not care or were ignorant. Each is equally objectionable. I was placed in an impossible situation. I could enter the building via an obvious illegal entrance or not participate in the event. I was angry and humiliated. I think I had no choice but to do the ethical thing. I asserted my humanity and civil rights and refused to participate. In my opinion Berry and Friedman, conference organizers, did not care one iota. Access and inclusion was never valued. Inclusion was never deemed a priority. Berry and Friedman should be ashamed. Every participant should be equally ashamed. An event was held about disability and no one bothered to put any thought into wheelchair access. No one gave a damn. One last point. In terms of logistics, my time and effort to attend, was disrespected. This is the norm for me. No one considers the logistics I must perform in a world designed for bipedal people. I radically altered my schedule. I taught at Syracuse on Monday and Wednesday. After class I drove to Yale University where I gave a paper at the medical school on Death versus Disability and took on utilitarian philosophers for the first time. My talk drew a good audience. Access was flawlessly handled. I woke up very early the following day, chose not to have lunch with a friend in New Haven or make an easy drive home. I made arrangements for a friend to care for my black lab Kate. I chose to drove five hours back to Syracuse, picked up Kuusisto, drove another 90 minutes to Geneva, NY, and stayed in a hotel so I could be refreshed and ready to contribute. My effort was not reciprocated. In fact I was disrespected in the extreme. So here I sit a day later and I am still seething. How can people supposedly interested in disability appear to be content excluding the voices of people with a disability. How can these people live themselves knowing they humiliated and embarrassed me? Stunned. I remain stunned and wonder when and if a sorry might be forthcoming.Yet again the slogan "nothing without us" seems timely and apt. I dream of a day when this slogan needs to be explained because I live in an inclusive society That world does not exist. I hope to see it come into existence someday but I doubt I will live that long.